The Smoky People's second main precept: "You can't find what you're not looking for." This means that, no matter how smart or hardworking you are, you can't build a great amp or loudspeaker if you're not able to imagine what a great amp or speaker would sound like while playing real music. These dicta have long been my spiritual mantras, and they have served me well. Combined, they are like psychic Refresh buttons that keep my mind open and make it possible for me to imagine alternative possibilities while minimizing my susceptibility to dogma. My susceptibility to garden nymphs with flowers in their hair is a different story. One August day, while taking a break from the blazing sun in my garden, I was drinking ice water with Jasmine in front of my stereo. She was only 23. I was struck speechless by her preternaturally beautiful, rosy, hormone-charged cheeks. Her neon-blue eyes sparkled as she said, "I love your 1200! I had to give my Technics away . . . would you play my father's Studio One vinyls?" (Time slowed. I could barely hear her words.) "He used to play them for me. They were all I inherited when he died . . . I really need to hear them." Jasmine is a blonde-haired German Mädchen, a Fulbright Scholar doing her master's thesis on the impact of pirate TV on Italian politics. Standing even closer to me, and smelling like a whole garden, she continued: "I can get them now, and . . . I have a fatty spliff!" I began chattering nervously. "Of course. While you're fetching them, I'll find some Red Stripe . . ."
Later, as I sorted through Jasmine's dad's records, I blabbered, "I really wish I owned some Studio One LPs! Did you know that our DJ friend Anthony used to work there? Yeah . . . after they moved from Kingston [Jamaica] to Fulton Street [Brooklyn]? He knew Coxsone Dodd!" Do your female friends "love" your VPI Classic? Did your maîtresse regret having to sell her Brinkmann Bardo? I didn't think so. The following is a true story about falling in love with two Jasmines, a stoop-sale turntable, a new British tonearm, and my discovery of the Abis SA-1.2. When I reviewed the Pioneer PLX-1000 turntable in my March 2015 column, I intuitively knew it would play music with a righteous intensity. I recognized that it sounded slightly more "together" than a Technics SL-1200 Mk.2, but I didn't know how either of those direct-drive 'tables would compare to a classic belt-drive model like the Linn LP12, or a renowned idler drive like the Thorens TD 124. Therefore, when I finished the Pioneer review, I decided to continue to study and listen more closely to each of these platter-turning strategiesand share my experiences along the path. To that end, I acquired a clean, low-mileage Linn LP12 with a Linn Basik LV X tonearm, and a 1957 Thorens TD 124 (serial no. 4995). I had already bought, for $70 at a Brooklyn stoop sale, a Technics SL-1200 Mk.2 with a broken tonearm. The stoop-sale guy said, "I dropped it and it fell on the tonearm. That's why I'm selling it so cheap." Vintage turntables, including my stoop-sale Technics SL-1200 Mk.2, are like Egyptian ka figures: they capture and hold the spirit of their former owners. Each is also a palimpsest that reveals the marks of its manufacturer and owner(s)evidence of the place and time they were made, how many of them were sold, how they were used. When we buy a used turntable, we are buying a ritual tool and aesthetic object that has held pride of placesometimes for decadesat the center of another human's joyful, meditative, maybe even ecstatic music rituals. No question, this stoop-sale 1200 had seen a lot of DJ use, but I didn't own a turntable at the time. The guy wanted only $70, and all it needed was a tonearm: How could I say no? Before I paid, the stoop dude let me plug it in to check it. It turned on, the lights worked, and, according to the built-in strobe, the platter spun at exactly 331/3 and 45rpmplus the brake stopped the platter on a dime. I gave him $80 and told him to keep the change. I was a happy customer. Technics has sold more than a million SL-1200s. I would guess that, like vintage Harley-Davidsons, 300D Mercedes, or Jeep CJs, nearly every one of them is still starting and spinning along. Because of their industrial-strength beauty and rugged efficiency, each of these examples of engineering prowess has become a coveted objet d'art still rising in value as I type. The first thing I did when I got the Technics home was call turntable guru Mike Trei and ask him what I should use for bearing oil. He told me that he once ordered some oil from Technics, and when the bottle arrived it was labeled "Pellet Heater Motor Oil: Anderol 465." I bought my 1.7oz bottle of Anderol on eBay for $15.95. It appears to be a nonparaffin-based synthetic oil formulated to offer long-term lubrication over a wide temperature range, as well as resist gumming and prevent speed fluctuations. After cleaning the 1200's spindle and bearing well with isopropyl alcohol, I warmed the bottle of Anderol 465 under a hot-water faucet, then put two drops on the spindle and one in the well. Moments later, the platter was spinning fast and easy. If any of you think you know what a Technics SL-1200 Mk.2 sounds like, all I can say is, unless you've experienced it with a world-class audiophile tonearm and a well-matched audiophile cartridge, you're wrong. The original tonearm is almost a toyalbeit a fairly sturdy one. At the time of the Stooptechnics' arrival, I had two 9" SME tonearms on loan: a vintage 3009 Series II Improved, and a cool new SME M2-9 ($1099) with a straight stainless steel armtube, a detachable magnesium headshell, an effective mass of approximately 9.5gm, andto my touch and feelfirst-quality gimbal bearings. I'd already used the M2-9 on a Thorens TD 124, and it played with several measures more authority and grace than the weak- and sometimes vague-sounding 3009 Series II Improved. Additionally, the M2-9 made possible extremely user-friendly adjustment of azimuth, bias, vertical tracking angle (VTA), and stylus rake angle (SRA). As with Jeep Wrangler CJs, Linn LP12s, and vintage idler-drive turntables, an endless variety of stock and modification parts is available for the Technics SL-1200. On the Technics mod-and-restoration scene, KAB Electro Acoustics is the oldest (since 1990) and most widely respected company. Its founder-owner, Kevin Barrett, sells everything you could ever need for your SL-1200, and does complete service and restoration as well. For my stooptable, I bought from KAB an NOS SL-1200 thick rubber platter mat ($39). The only thing KAB doesn't sell is armboards. Therefore, I bought on eBay a pre-drilled, stainless-steel SME armboard for $100 and a very nice 3mm-thick anodized aluminum blank armboard for $39. I installed the SME M2-9 first, because I imagined it would be easier. I was wrong. Opening the bottom of the Technics SL-1200 was easy and educational; I noticed right away just how heavy-duty and professional-strength this machine really is. Because of the bulky nature of the underside of SME arms, some drilling and sawing was involved, but I found countless YouTube videos to hold my hand and answer every question. Installing the M2-9 arm was good gearhead fun, but listening to the results of my efforts was one of the high points of my Stereophile cub-reporter life. The first cartridge I installed was the Soundsmith Carmen ($700). It purred and sang. Think smooth and quiet. The sound of cogging? "Hunt-and-peck" servo weirdness? I'd never heard that stuff before, and I was surely not experiencing it now. High frequencies were clear and clean, emerging from tangibly empty space. More important, what most audiophiles fail to realize is that with some belt-drive 'tables, you'll hear distortions caused by dynamic stylus dragespecially in the most highly modulated regions of a record's groove. High-torque, direct-drive 'tables like the 1200 solve that problem completely. The SME M2-9 with Soundsmith Carmen traced and scaled the grooves so silently and lusciously that they made the old Technics arm (and, thus, the 1200s you've experienced) sound opaque and metallic. Imaging improved by about 60%. Never-before-heard microdynamics became a delicious feast, and macrodynamics became something to prepare for! This combo was born to play massed strings and choral music. Think about it: $500 will buy anyone a slick, clean, good-working used SL-1200 Mk.2; allocate $100 for the armboard, $1099 for a brand-new SME M2-9 arm, and $700 for a Soundsmith Carmen cartridge, and the total is still under $2500 for a record player that this humble peasant thinks will let you dance the tarantella with the prettiest damsels in the audiophile garden. When it comes to record players and their mechanical intricacies, I believe in the words of Taoist Master Mike Trei: "The job of the cartridge is to measure the groove. 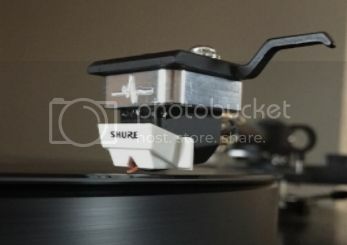 To do this with accuracy, you must have a mechanically rigid loop from the cartridge, through the tonearm and turntable structure, to the record. Imagine trying to use a tape measure with a stretchy elastic section in the middle to measure things. If you look at Rega turntables, they found that by putting a stiff steel brace between the platter bearing and the base of the tonearm, there was a significant improvement in information retrieval from the record." Do you know WHY the SL 1200 sold so well? Because it sounds every bit as good as any of these $5,000-$20,000 plus turntables made by the small 'garden shed' outfits which most turntable manufacturers are. BTW: I've never met a garden nymph with roses in her hair. Do you have a lot of them in the USA? Belt drive? It's all these little outfits having neither the technical knowledge nor the engineering facilities to make a direct drive turntable. So they decry direct drive, which is far too complicated for their so-called 'expertise'. 'Subjective'? No. None of us, having no access to the studio when the recording was made, can know what it is supposed to sound like anyway. "I like the sound my turntable makes". Since when has HiFi got anything to do with what you 'like'? The very phrase 'High Fidelity' means accuracy. If you don't lke the sound of YOUR recording of Handels Water Music or whatever, buy a different recording. I bet the SL 1200 imposes far less 'signature' or 'color' to the music than these garden shed turntables do. BTW: Strange you had to do all that work to fit the SME arm. I just purchased an arm board to suit any SME '9 inch' arm and my Series IV bolted straight in, except for cutting a small bit of the 'rubber' SL 1200 base away. After reading Herb's article I decided to (for now) not purchase the new 1200 but a used, mint 1200 mk5 and make some of the upgrades that are out there. I too will be putting an SMEIV so just curious as to how much cutting of the base is needed. Isn't that base quite fragile? No. It's not a problem. The turntable top is a solid casting (zinc I suspect, like car door handles, and zinc is a material that doesn't 'ring') with a recessed round hole about 5 inches diameter with the arm mount attached to it by 4 'knurled' hand tightenable plus a screwdriver slot bolts and separated by a soft 'rubber' gasket. You just buy a 'SME' or whatever plate from an accessory dealer (and I think Technics may have made them too). If you mean the 'rubber' base I mentioned, it's a thick with plenty of material, soft(ish) thing. I just cut a rather crude hole in it with a modelling knife as the SME underside is deep enough to need it. Regarding other so-called 'upgrades', only obsessives buy them. It's perfectly well designed in the first place, by people with far more experience than any of these 'improvement' people. (Such gadget shops, but in a different field, won't improve your Mercedes or Ferrari either.) And the SL 1200 is built to a VERY high standard. If you think it's worth it, you might remove the power transformer, extend its low voltage wires, and mount it in an box externally. Some think it is worth it for lower magnetic fields and less vibration. I think that is unlikely but it's just my opinion. I might go further and put the timestep or KAB PS which ostensibly invalidates the internal transformer for one outside. We'll see. Was seriously considering getting the new one at 4k but thought it over and decided to just get a used one for now and see what Technics offers in the future with newer mods; perhaps a 1200 without tonearm. But for now will buy the used one and mod that with another new SME IV as I already own another one on my VPI. I think I read it 3 times when my subscription came in. Nice to see that configuration mentioned in print finally, since the SC35C isn't suited for much in the way of modern arms. So what were your final thoughts on the 1200 vs LP12 and TD124? Sorry if I overlooked it. Stay tuned: I promise to not only compare those three classics to each other, but to every turntable I review after that. Thank you for reading my story. Glad to see a touch of elbow grease and hacker culture! I rebuilt a sad Garrard 301 that'd lived in a basement closet since the 60s and paired it with an early SME 3009 Series II I also rebuilt. The arm has custom brass weights for heavy carts and a beefy brass mounting plate, as well as a Stage 2 Zu Denon 103 MKII. The complete setup sounds 99.8% as good as the $25K rig my audio dealer runs in his shop. Hearing his rig and mine within an hour of each other (his shop is almost down the street), and with the same records, really slapped me out the vampire trance a couple of the ultra high-end ($$$) makers had on me... Also, I have that Nonesuch record, too, and it's one of my favorites. Thank you for a very interesting article. I'm wondering whether the same procedure would be possible on the Pioneer PLX-1000? Is the arm mount the same? Being a 16 year old budding audiophile back in 1983/84 and having lusted after an MKII version, I got a summer job in my dad's company in Curacao, Netherlands Antilles. After 6 weeks of sweating away stacking boxes in an unairconditioned warehouse and making deliveries I finally earned enough (650 Antillean Guilders, roughly the same as US Dollars) to buy one with an Audio Technica cartridge. I had it hooked up to a Technics SU V4A integrated amp, Radio Shack mixer, Sansui SPX8 speakers, Technics RSM85MKII cassette deck and another Technics DD Turntable and a few other components. The build was astounding. Used this combo to earn some money on the side DJing at house parties to feed my habit. Great article.